Jenkins Crag Romney Grange Self-cateringAlways one of our most popular properties this delightful apartment is situated on the top floor of Romney Grange. Clients will enjoy a high standard of comfort and quality together with the fine lake views which complete the holiday feel. The head of Windermere is just a short stroll away from where you can take steamer cruises on the lake and there are a number of places to eat within easy walking distance. Jenkins Crag has been furnished with every thought for your holiday comfort and will make an ideal destination for your Lakeland holiday at any time of the year. Accommodation: Entrance to second floor level by either stairs or lift. Internal front door leads into entrance hall - useful coats cupboard - and then into the sunny L-shaped lounge/dining room (40" TV with Freeview Play, DVD, wi-fi broadband, radio/CD/Ipod dock). Patio door opens to balcony where you can sit and take in the view. The fitted German contemporary kitchen is in cherry wood with a full complement of equipment and enjoys views to the rear gardens. There are two bedrooms - master double has a five foot bed and en-suite shower room is fully tiled with walk in rain shower (shower, basin, wc). Second bedroom is a twin. The main bathroom is fully tiled (bath with shower over, basin and wc). Both bedrooms have garden views, TV and radio/iPod dock. Jenkins Crag has storage heaters and panel heaters throughout and is well insulated. Fitted carpets throughout. The quality furnishings offer a very good degree of comfort throughout. Outside: Private parking for one car in designated space. 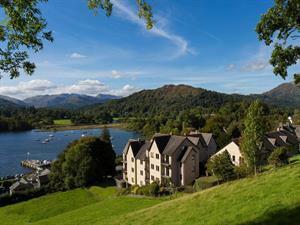 Communal gardens with seating areas and views of lake Windermere. Ambleside village half a mile and lake Windermere and steamers 50 yards. No pets or smokers * duvets/beds made up for arrival * towels provided * free wi-fi broadband * electric fan oven and induction hob * combination microwave * fridge/freezer * auto washer/dryer * dishwasher * all fuel included * private parking for one car * nearest shops and post office in Ambleside half a mile * good pub and restaurants, lake steamers and lake shore 2 mins walk * travel cot and high chair available - please order. Always one of our most popular properties this delightful apartment is situated on the top floor of Romney Grange. Clients will enjoy a high standard of comfort and quality together with the fine lake views which complete the holiday feel. Jenkins Crag Romney Grange offers weekly bookings starting on Saturday.